Discussion in 'Lighting and Electrics' started by LightFrench, Jul 13, 2017. I'm new here and recently found an old Mole Richardson SolarSpot Type 410 that I would love to pamper and refurbish. I have never done this before and heck - let me be honest, I am not the biggest DYI buff around the block. So I got this old MR SolarSpot Type 410 that I am keen to refurbish for domestic use. It is all dirty with black paint and rusty in some parts. I know there has been at least one thread that I have checked out on your website but since it was quite old (2010), I thought I'd check and see whether people now had more advice to share with a newbie like me? I'm thinking of going a couple of different routes as far as refurbishment is concerned - not sure yet. Once thing though, I would like to take all paint off, treat for rust, police and maybe apply difference colours. It would be amazing to hear from anyone, if and when you have a sec to respond. a; Welcome to Control Booth. b; Are you planning to restore to operating condition or merely clean it up as a safe show-piece free of any asbestos etcetera? LightFrench and RonHebbard like this. 6: Spray w/ good hi-temp primer, allow to dry 24 hrs. 7: Spray all internals w/hi-temp flat black paint, allow to dry 24 hrs min. 8: Spray all externals w/M-R paint (Available from M-R, or it used to be), allow to dry 24 hrs. min. 10: Put a lamp in it, plug it in & warm it up on a dimmer at about 50% for a couple hours to cure the paint. b; planning to restore to operating condition and if there is asbestos I would like to remove it too actually. Very ingenious, I like it! What a detailed response, this is so helpful. I had thought of taking photos, drawing diagrams and numbering each pieces so I don't get lost later. So I'm glad seeing that is point number 1 on your list! I don't know much about asbestos removal and safe practices though, so will have to look into that properly. We have two young babies at home so I need to be very careful how I deal with that. Question on your point 3 removing paint: do you think just good old elbow grease and a wire brush will be enough? I was considering renting a small sandblasting machine (dry, so just sand no water). But that may be a little overkill, not sure. Thanks a lot for your help Jon, this is a great start. I will let you guys know how I'm getting on with it...and might post more questions if I get stuck! The "easiest" way to remove paint is a product called Aircraft Remover. Melts the stuff right off. The only problem is that once it's lifted the paint, you need to scrape it off. That's no good for small spaces where tools can't reach. It also leaves behind "melted paint gunk" which can be difficult to remove once it re-hardens. Oh, also the stuff is caustic as hell and you need to wear proper PPE when using it. Since MR fixtures have that louvered design, I'd avoid it. You mentioned a sandblasting rig. Although sandblasting can damage metal to some extent (pitting), this is probably the best course of action (to save yourself some headaches). Instead of renting a sandblasting rig, maybe you could try to convince a local autobody shop or powder coater to do the work for you? Oh man, powder coat would be a great way to finish this light, but prepare to spend money on that. If you want to go back to the original color, you can buy Mole Mauve in a rattle can. I once converted a Mole Richardson to domestic use by putting a small clip-on lamp inside. My fixture had a switch and I got fancy and wired it in, but you need not do that as long as you can find a safe way for the cord to exit the fixture. @LightFrench A used egg carton or plastic ice cube tray can be an easy way to sort small hardware keeping parts logically separated / grouped and / or in order. I used four trays on one major disassembly project and came up with several convenient ways to label parts and sequences over the years. I could write paragraphs on sorting and labeling but I suspect you can figure that out. Obviously, don't inadvertently dump the trays when setting them aside for future reassembly. LightFrench and GreyWyvern like this. Mole Mauve clashes with so many interior decorator color schemes. Make sure you have a stand. Needn't be authentic, although an old c-stand would be. Could also be a telescope or camera tripod. We've even seen a light advertised on a stand from a dressmaker's dummy. 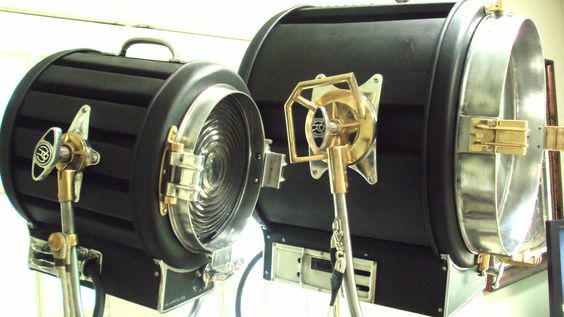 See also https://www.controlbooth.com/threads/lighting-fixture-maintenance.12561/ . Simply skip the parts that don't apply to your type of fixture. @LightFrench Thanks. No, hand brushing won't do the job. I was referring to a wire wheel on a grinder or either a wheel or end brush in an electric drill. As to the asbestos, the fibers floating around in the air and being breathed in are the problem. I've had luck removing asbestos wire by wetting it with soapy water (soap lowers surface tension so it will penetrate better) and carefully and slowly removing it, placing it in a plastic bag and sealing the bag. The wetting will keep stray fibers from "fluffing off" the wire. And as to Derek's comment re: M-R mauve, no, it doesn't blend with much, but it's traditional. If you're "restoring," use it; if you're "updating" polish the brass & use what looks pretty. Hi Les, thanks for the ideas, Powder coating sounds great I hadn't thought about it! Though I would like to do everything myself, it's a personal project where I want to take time, learn about restoration techniques, do the research and then pull up my sleeves and do it. Not sure about the wiring yet, I'll have to look into it when I get there! Hey thanks for your response, much appreciated! Hi Ron, good advice! I as going to use envelopes and then realised I might need way more than I thought and it could quickly become overwhelming - and not very practical! I will take some photos as I go along and will let you know guys. Hey Derek, yes it cam with a stand which looks very much authentic so I'm happy. Oh those two on your photos look amazing, this is an idea of updating I'm definitely considering. How elegant yet it keeps a certain cachet of being aged. Beautiful. Thanks for the link and great contribution thanks D. I will go through now. @LightFrench Being able to see the parts (clear containers) beats paper envelopes hands down. Trays that stack safely without dumping / tipping occupy less lateral storage space. Wrapping trays with Saran wrap / Cling and seal keeps parts from migrating into neighboring egg cups when handling trays and storing for days while waiting for paint to dry. Numbering trays helps with maintaining correct sequential order. I could go on but I suspect you've got the idea. Again, very specific - thanks Jon! I have an electric drill great, so will pop out and get a couple of wire wheels and end brushes of varying sizes that should work well. As for the asbestos, I will get myself a mask and an extra pair of gloves and do this outside. Can't be careful enough so I also checked the disposal regulations in my state so will make sure to comply safely. Not a big fan of the Mauve, I know it's historically accurate but I am more after an "update" in that case, so will consider more accommodating aesthetics. Thanks a lot again Jon, I will take photos and keep you guys posted if you are interested. @LightFrench Dremel brushes and thin flexible sanding discs can be VERY useful in tight quarters with variable speed and a flexible shaft as well. @LightFrench Yes, asbestos in the lungs is not a good thing. But some guy working for 5 years 10 hrs/day insulating the insides of submarines during W.W.II and breathing the stuff all day is far different from some guy working once in his back yard for 1 0 minutes removing a couple wires. There is such a thing a s degree. Excellent, thanks Ron! Just came back from the DYI store now actually..